In my last blog post, I identified the gestures that compose the Latter-Day Saint hymn “Father in Heaven, We Do Believe.” Today I’ll show how these gestures are elaborated and how all these elements work in concert to make the arrival on “we receive” so striking. In the first phrase, the harmony of 1-6-2-5 follows close to its ideal form, with only a seventh added to the alto to smooth the voice leading. In addition this gesture, along with all the others, is given a more specific rhythm. Such repetitions are perhaps the simplest embellishment a composer can make, but they’re sometimes forgotten. The descending tetrachord has a fascinating elaboration. One beautiful detail is how the soprano in bars 4-5 foreshadows the gesture by imitation (G–F–E-flat to C–B-flat–A–flat). The bass of the 1-6-4-5-1 follows its schemata with minimal alterations. In bar 11, she writes a voice exchange that sets up expanding contrary motion into the 6/4 over the dominant. That expanding contrary motion gracefully parallels that of bars 10-11. Crawford’s changes to the soprano line are more significant. 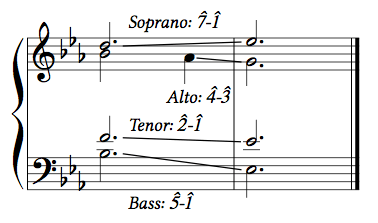 The tenor and the soprano swap places in bars 10-11, as do the alto and the soprano in the antepenultimate2 bar. Artistically, these changes allow Crawford to create a lovely chain of upward motions in the soprano (G-C, A-flat–B-flat, F-G). Craft-wise, they cause her to change the tenor line in bar 9 to improve the voice leading. Why is the arrival on “we receive” so striking? But these aren’t the only ways that Crawford has prepared this moment to be special. Because phrase 2 begins almost identically as phrase 1, one would presume both phrases to share the 1-6-2-5 model. The use of the subdominant at bar 10 thwarts the listener’s expectation of supertonic. These parallel openings going different directions can be thought of as a kind of musical alliteration. Temporarily suspended, this pattern reaches its fulfillment at the climax in bar 8 — the precise point to which Crawford has drawn our attention through other means. At this point, background (the Romanesca) and foreground (the 1-6-4-5-1) converge for the hymn’s final cadence.